The Klettgau-Randen Valley runs northeast and crosses the German-Swiss border just north of Erzingen, the largest town between Waldshut-Tiengen and Schaffhausen. 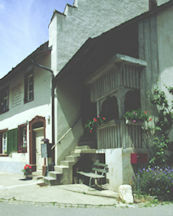 Properly, the "Randen" is the mountain range into which Siblingen leans and which separates the Klettgau valley in Switzerland from German;y to the north. This valley is the farmland of Schaffhausen canton. Many crops can be grown here. One sees vines for wine on the south-facing hillsides at Lohningen and Schaffhausen. In the autumn stacks of sugar beet dot the landscape. The Rhine flows from the Bodensee/Lake Constance west to Schaffhausen town, turns south over the Rhinefalls at Neuhausen am Rheinfall, then does an S-curve around Rheinau where Germany has intruded between Zürich and Schaffhausen cantons. While the Rhinefalls are not just beautiful in its changing ways over the seasons, but also the biggest in Europe, they are not part of the valley. It is a narrow pass from Neuhausen into the valley that leads to the first valley town; Beringen. Our tour will proceed largely in a clockwise direction from here, ending in Siblingen. Several Beringen surnames show in the Storrer (/Weber et al) Siblingen genealogy ; Bolli, Bollinger, Schlâpfer, Roost and Tanner. Elisabeth Tanner is recent; 1898-1985. 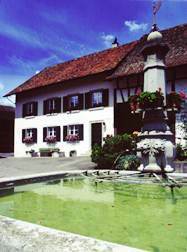 West from Beringen is Löhningen, proud of its wine. 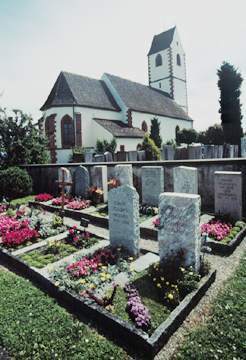 In this cemetery one finds Schwaninger, Walter, Rüedi and Müller . Taking the road south from Löhningen one reaches Güntmadigen, leaning into the mountains on the south side of the valley. 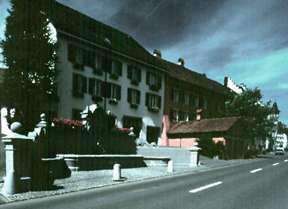 The road west from Güntmadigen leads to the main town of the valley, Neunkirch. Continuing a route clockwise through the valley, we come to Hallau. 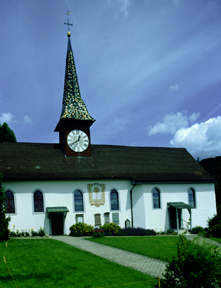 The church of Hallau-on-the-Hill (a.k.a. 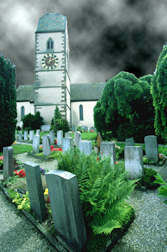 Bergkirche St. Moritz) finds the following names on gravestones; Rahm, Pfund, Murbach, Surbeck, Gasser and Schöttli. 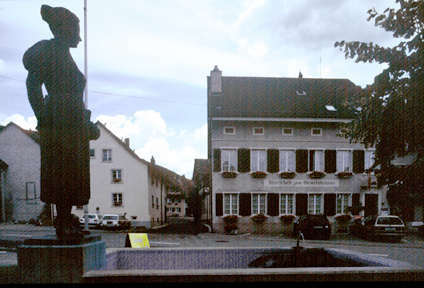 Oberhallau overlooks Hallau, and is the town from which both the American (Texas) Tanners came to America and the Tanners who married Siblingers came. 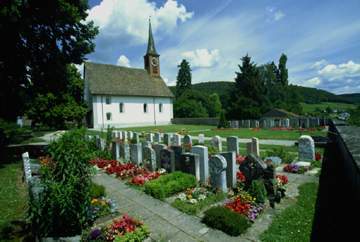 The Oberhallau graveyard reveals the following names; Tanner, Schaad, Ochsner, Surbeck and Baumann. Gächlingen is the next town as we now head northwest towards Siblingen. 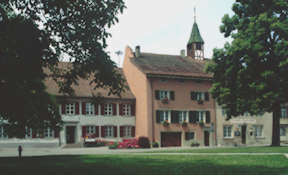 Gächlingen gives us several familiar names; Weber, Rüedi, Murbach, Vögeli, Hepp, Müller and Surbeck. American's tracing their family should be careful, however, to read too much into certain names. For instance, every town of any decent size had its miller (Müller), and any town might have a weaver (Weber). In this tour around the valley south of the Randen, we have had to overlook some towns, for lack of pertinent information. Time will allow us to obtain this information and add it to the database. 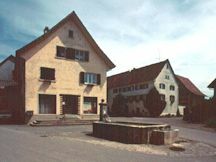 Among these are Wilchingen, Trasadingen and Osterfingen are part of the valley, while Schleitheim and Begingen are on the road out the northwest border of Schaffhausen canton. The entire contents of this web site are copyright © MMV William Allin Storrer.